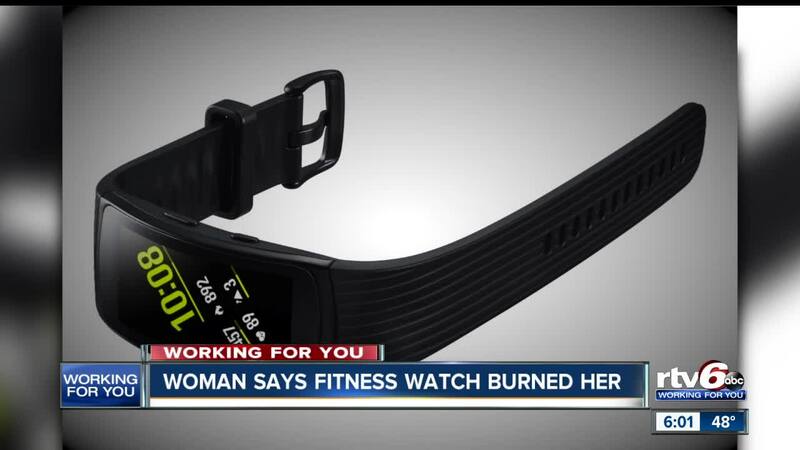 INDIANAPOLIS, Indiana — A central Indiana woman is warning others after she says her fitness watch left burns on her wrist. Carrie Scherschel says the burns came from her Samsung Gear Fit 2 Pro Watch, and it’s happened on more than one occasion. “It lined up perfectly with the two pegs underneath where the charging is,” said Scherschel. She’s not the only one who’s complained about the issue. Samsung has a community forum online with complaints about similar problems dating back to January of last year. Scherschel says she’s reached out to Samsung and they told her that the issue could be something she’s doing. She says she sent her watch back to the company and has been waiting for a refund since September. “We stand behind the quality and safety of our devices. We regret Ms. Scherschel’s experience and we are following up with her to resolve the matter to her satisfaction. Unless Samsung is able to thoroughly examine the device, it is impossible to determine the true cause of an incident. We encourage any customer with questions to contact us directly at 1-800-SAMSUNG."